I’d been meaning to replace my white ceramic neti pot ever since there was a minor mold incident in my last home about a year ago, so I was delighted when my local health food store got in a shipment of beautifully glazed, lead-free Baraka ceramic neti pots. I chose the beautiful purple version. As anyone with chemical sensitivities knows, I first had to “offgas” the pot outside in the sun for a day or two, then clean and soak it in water with some drops of grapefruit seed oil. Once cleaned of all residues from the manufacturing and shipping process, she was ready to go. I must admit that I was not all gung-ho to pour saline water up my nostrils, even though I had done it in the past. If you never heard of neti pots, you might be wondering why I would ever do such a thing. Well, neti pot cleansing has been used for centuries as a purification technique in India and South East Asia. Many people rave about their daily neti pot routine and the benefits it bestows on their sinuses – including reduced allergies, easier breathing, help with post-nasal drip, and an improved sense of smell and taste. It’s also helped some to eliminate chronic sinus infections and avoid the common cold. It works by helping to flush out excess mucus, keeping the sinuses hydrated and clear so that the nasal cilia can do their job of flushing out bacteria, allergens and other irritants. Ironically, when I first started, the practice actually seemed to inflame my sinuses and cause me to have a stuffy nose. But I persevered. For a few days last week, I stopped doing the neti pot each morning, and you know what? I missed it. Although I have yet to notice improvements in my post-nasal drip and other sinus symptoms, I did notice that doing the neti pot each day does contribute to a calming effect throughout the day. I enjoy having it as a part of my daily routine. I currently do it when I wake up, but hope to increase to 2-3x a day. While I pour the saline water through my sinuses, I visualize that salt water banishing all fungal infections out of my sinus cavities. 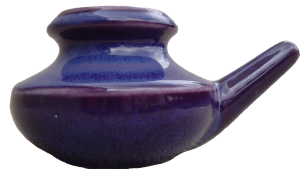 Fill the neti pot just below its lip with warm water. Add a heaping 1/2 teaspoon of sea salt and stir until it is thoroughly dissolved. Bend over the sink and turn your head to one side. Keeping the pot level, place the spout into the top nostril. Breathe normally through your mouth and slowly tip your head downward allowing the warm water to travel up through your sinuses and out the other nostril. You may need to adjust the angle of your head slightly in order to allow the water to flow out the other nostril. Use half the water and repeat on the other side. If you experience an uncomfortable sensation, adjust the level of salt. 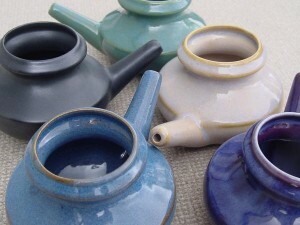 I’d love to hear from others on how often they use their neti pot, what type of salt they use, and what benefits they’ve noticed. I would any day prefer neilmed plastic netipot which is very convenient for travel as well. and the best part is it comes with premixed packets that are very safe and do not burn. I also heard they are offering free on their facebook ! Baraka also sells the right salt packs to use. I would personally never choose plastic anything over lead-free ceramic. I am very reactive to plastics, as many with chemical sensitivity are, and so the ceramic and porcelain versions are ideal for my needs. Plastic definitely sounds less risky for travel but most of us with chemical sensitivity do not travel much.